In the past few days i’ve become fairly obsessed with Maverick Bird, the Flappy Bird tribute created by Terry Cavanagh who is to blame for me losing countless hours of productivity due to Super Hexagon. As I’ve started to get better at the game at a level where i can make certain gameplay decisions by reflex more than deliberate choice, I’ve also started to notice a subtle difference in how i approach the game philosophically and psychologically versus the original Flappy Bird, and that’s brought to light some interesting and concrete revelations about both that draw analogies to how i approach music practice, music creation, and life. For me, the most fundamental brilliance about the design of Super Hexagon is how it parallels the mastery of learning a musical instrument (as well as other skills), primarily because of the relativity of perceived difficulty. Super Hexagon has six difficulty stages which are broken into two sets of three. When i first started to play the game, Stage 1 (labeled “Hard”) felt daunting enough as it was – everything seemed to be moving incredibly quickly, and i was constantly dying in 10s or less. This happened often – probably literally hundreds of times – before i got past that point and then it took maybe another 50-75 tries to hit the 20s mark. As i got more comfortable with it, it became easier to reach higher rates of achievement, but much of it still felt like floundering and a reactionary approach to the game as opposed to true mastery. The main difficulty difference between Stage 3 (labeled “Hardest”) versus Stage 1 is speed – not just the speed of the obstacles coming at you, but also how quickly you move as a player. Despite my level of comfort increasing in Stages 1 and 2 where getting 30-40s was, if not easy, at least more graspable, that slight increase of speed and mobility of Stage 3 schooled me for probably at least 200-300 gameplays before i passed 15s for the first time. At this point i was fairly obsessed with the game, trying to achieve the 60s mark, and i discovered that trying to play Stage 1 and 2 would throw me off because the timing felt so different from Stage 1, so i deliberately stopped playing those stages for a good week or so while i attempted to master Stage 3. I think it was when i was able to get to the 40-50s mark in Stage 3 that I decided to take a break and go back to Stage 1, and I discovered to my surprise that Stage 1 didn’t just feel easy, it felt slow. I remember the sensation of playing the game for the first time and thinking that i had to react so quickly to everything, something that would induce an adrenaline rush and a sense of urgency. But after I had trained myself to get used to the way Stage 3 was timed, I went back to Stage 1 and felt like i had all of the time in the world to react to what was going on – enough that I could sometimes make a poor judgement call, realize that a fraction of a second later, and then make an error correction that would cause me to not die, which is something that felt impossible when i first started. And once i got good enough at Stage 3 and started to play the “challenge stages”, Stage 6 schooled me in the same way that Stage 3 had initially, and then when i got good enough at that and went back to Stage 3, Stage 3 similarly felt not just easy but slow. This feeling was further amplified the more people i showed the game to who would try the first stage, watch me play the sixth stage, and be flabbergasted at how i could react so quickly when it no longer felt quick to me at all. Conceptually this ended up being reinforced by people who started to obsess with the game as much as me that would describe a similar experience of those early stages feeling like a crawl compared to the later stages once they became expert players. There are many many similar experiences that i’ve had with other video games, particularly music video games, and i know that there are a lot of professions, particularly sports, in which that comes into play as well. In one of James Burke’s early television shows Connections, Burke used race car driving as that analogy, saying that professional race car drivers are so practiced in driving at fast speeds that they feel like they have all of the time in the world to react to situations around them that they’ve turned into instinct and reflex. With sports and other professions, there’s a science behind how someone can be trained to get to that level of achievement, a pedagogical approach combined with hours and days of practice. With Super Hexagon, the game design monopolizes on that science, creating an experience that is easy for anyone to grasp just by picking up the game and pressing “go”, but takes hours and days to master, and, more importantly, rewarding the time spent by the player in very concrete measurable and iterative ways that motivate the player to want to get even better. I knew i was improving at the game, and that fueled me to reach that next step of expertise by constantly analysing how i could improve on my technique, then applying those techniques and practicing them over and over again, all motivated by sheer determination of wanting to reach a decent level of mastery – which i eventually did. Although the paradigm of Maverick Bird is more akin to Flappy Bird than Super Hexagon, the craft of the game design reminds me strongly of Super Hexagon in a way that Flappy Bird fails to achieve. With Flappy Bird, there’s a measurable finite amount of situations the player has to learn in order to master the game. Not to say that the game is easy; the margin of error to pass through the pipes and iterate your score is very narrow, and the physics of maneuvering the flappy bird takes some getting used to. You’re given no “training mode” or any degree of forgiveness for imperfection. You either get through the pipe, or you die. But once you get used to the gravity physics and learn how to manipulate the flapping to get to where you need to get through the pipes, achieving high scores is seemingly left to simple practice and repetition. That’s definitely a contrasting experience to that of playing Maverick Bird which i’ve now played for at least twice as long as its flappy counterpart, and I’m not only still learning how to get any level of mastery, but i’m also determined to do so in a way that i’m not motivated by Flappy Bird. With Cavanagh’s clone, it feels worth it to spend the time to experiment and explore new techniques and approaches and hone the precision of my gameplay in an attempt to more achieve more consistently, and that’s more complicated than it initially seems because of how the arc path of the maverick bird’s “flap” is not equal to the rate in which obstacles roll by (which is also true of Flappy Bird but to a much lesser degree), which means that the same obstacles sometimes requires a completely different action depending on where the bird is in its flight path, which can be subtly manipulated to make it easier or harder depending on when you’ve flapped previously. And never mind what the “drop” action does to add more flexibility and depth to the gameplay. From all of this, it makes it seem that Maverick Bird is the superior Flappy Bird experience. It captures the essence of Flappy Bird’s simplicity and expands on it in a Super Hexagon kind of way, complete with high-powered techno soundtrack. It’s immensely gratifying to get better at the game, not just to get a new high score, but to reliably get higher scores or become more consistent in dealing with obstacles and how to prepare for them. That said, Flappy Bird does achieve something that Maverick Bird doesn’t do, something that i think is fundamental to skill-building that today’s world sometimes loses sight of. I had said that once the mechanics of Flappy Bird is mastered, high achievability is seemingly achieved through simple repetition, but the reality of it is more complicated than that and more profound. To excel at Flappy Bird, the player has to have patience and perseverance, be willing to put in the time to practice the repetitions, which results in a level of confidence that getting the platinum medal 9 times out of 10 is a given, that achieving newer high scores is just a matter of time. And in that way, Flappy Bird is more akin to what is needed by the aspiring professional musician, the snare line of a world class DCI or WGI drumline that works to play every single simple and complex note with absolute clarity, the aspiring concert pianist who practices his scales every day for two hours prior to working on the actual music no matter how many times he’s played them before, the collegiate music conductor who spends the first ten minutes of every rehearsal with long tones, making sure that everyone in her ensemble is using their ears to blend and balance. 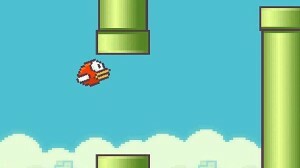 Perseverance in that Flappy Bird sensibility, therefore, feels more like a test of will and determination that has to come from within where Maverick Bird is Flappy Bird’s virtuosic and flashy partner, where the test of will and determination is inherently encouraged by the subtly complex game design. Both of them serve as an interesting complement to each other, and to me serves as an interesting set of analogies to important life skills; it’s the Flappy Bird sort of perseverance through almost a decade of patience and determination that got me to where i am today as a musician and what i humbly feel is a successful career as a collegiate marching band instructor and music composer. It’s the Maverick Bird sort of desire for virtuosic excellence and mastery that drives me to constantly exceed my own set of expectations and goals in those realms and in every other aspect of my life, to apply the fundamentals that i’ve drilled so meticulously into innovative and polished results. It’s possible that that analogy is a little self-masturbatory and stretches a bit thin. That’s okay; both Birds are still damned fun to play, if nothing else, you can take away that as the bottom line if you want. I wrote a giant thing about the two games then deleted it. It simply boiled down to the two being apples and oranges.